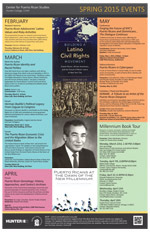 Centro is proud to announce an exciting calendar of events for the Spring semester. Our schedule of events began today with a research seminar focusing on the way Latino values influence Puerto Rican adolescents’ engagement in risky activities. It launches a diverse range of upcoming programs, including research seminars, Meet the Author events, forum discussions, conferences, and the opening of a new art exhibition. In March, we will be hosting a Meet the Author event with Sonia Song-Ha Lee, who will discuss her recent book Building a Latino Civil Rights Movement: Puerto Ricans, African Americans, and the Pursuit of Racial Justice in New York City. We will also sponsor a forum on the political legacy of the late Herman Badillo, and another on the economic crisis on Puerto Rico and its relationship to the current wave of migration. The economic conference will feature James Orr, the Vice President of the Federal Reserve Bank of New York, discussing the organization’s recent report on the economic crisis and Edwin Meléndez will discuss its connection to massive migration to the United States. The slate of events continues in April and May, starting with a forum on Puerto Rican genealogy that will include a demonstration of the ways in which the Centro Archives can aid in developing family archival history for Puerto Ricans. In May, Centro and the CUNY Dominican Studies Institute (based at City College) will co-host a day-long conference on the future of the Dominican and Puerto Rican communities in New York City, and their relationships to one another. In addition, Centro will host an event that discusses the ways in which Puerto Ricans are using social media to bridge geographically disparate communities, and create new ones. One of the most exciting events for this upcoming season will be the launching of the new gallery space at Centro Library in El Barrio. Our first exhibition in this space will feature the work of Lorenzo Homar, and the opening will include a panel discussion of his life and work, as well as a reception. Additionally, the Millennium Book Tour continues with events in The Bronx, Manhattan, Brooklyn, Miami, Orlando, and Chicago. Centro Director Edwin Meléndez will continue last year’s successful series of presentations highlighting the findings of the Centro publication Puerto Ricans at the Dawn of the New Millennium, featuring the most recent analysis of issues relevant to Puerto Ricans living in the United States. All Centro events are live streamed from our website and available on our Youtube channel: CentroPR. See the calendar for a complete lists of dates, times, locations, and presenters. We look forward to seeing you soon!